Note: I made a couple changes/omissions to the story. If you were in the group, you would understand. 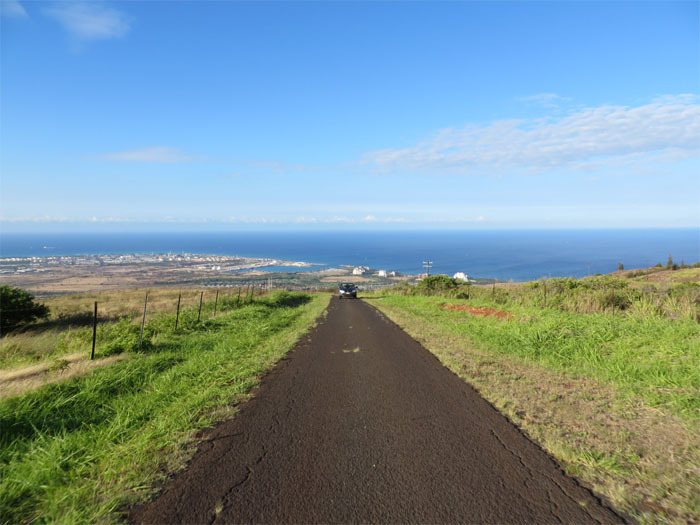 A small group of us made our way up from Umena Road in the nicely gentrified housing area of Makakilo. 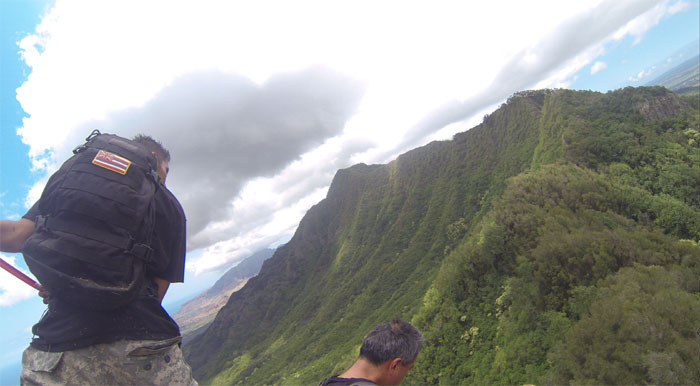 We were doing an exploratory-extreme hike today. Vehicles in all sizes and shapes passed us by as we made our way up the long and unforgiving road. 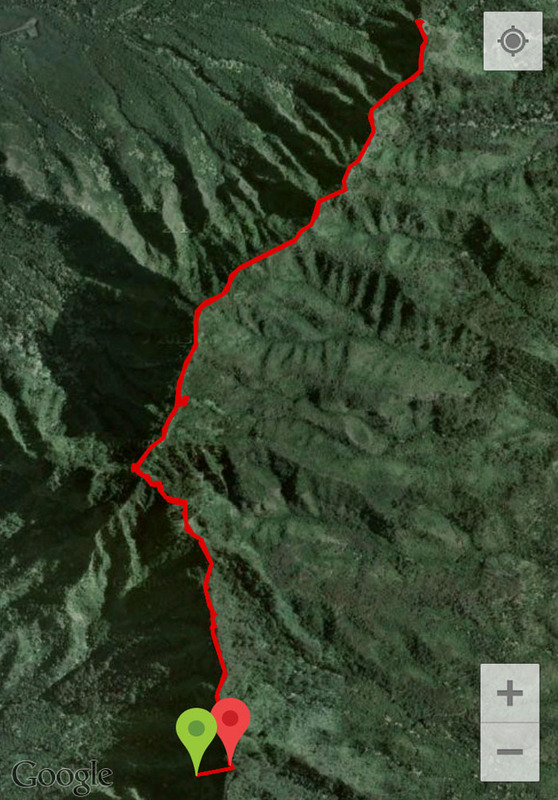 We soon passed the junction to Camp Timberline and continued right on the road. After passing the alphabetically numbered lots that had homes ranging from modest to McMansion, we made it to the trailhead. 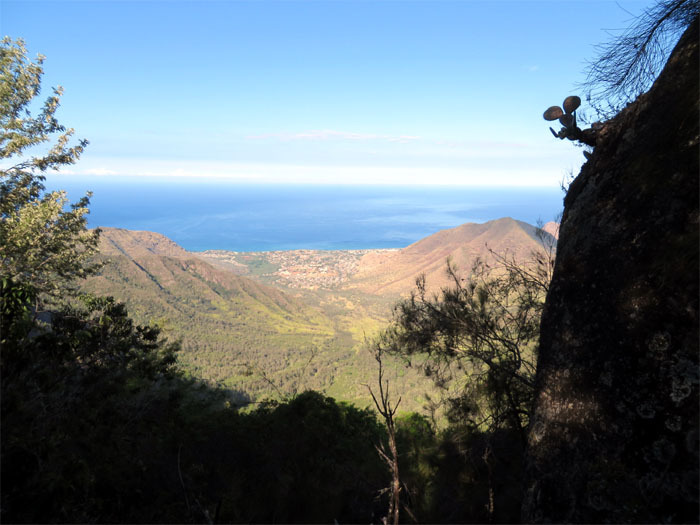 Instead of pounding the pavement, there are easier ways to get to this trailhead. One could hook up with an approved hiking club that would give you access to the two gates and then just drive all the way up to the trailhead. That would shave a lot of miles and time off. Passing the Mickey Mouse ears cactus still encrusted on the boulder at the top of Maunu Kapu. 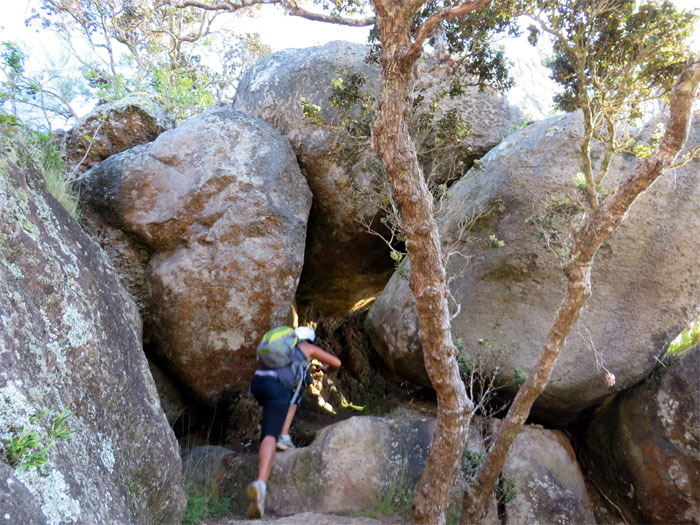 Playing Indiana Jones as we made our way through these jumbled boulders. Is it live, or is it a beetle? 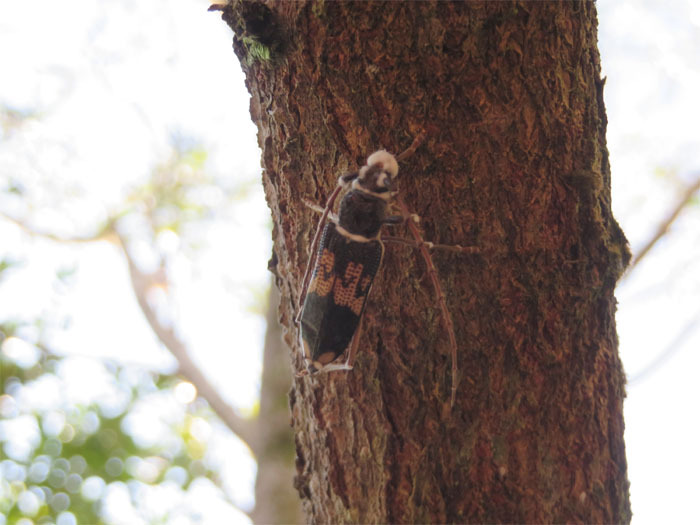 Our first bug sighting – some kind of coral beetle? It didn’t flinch even one antenna as we all took our turns at getting some macro shots. Must have been dead or playing possum. 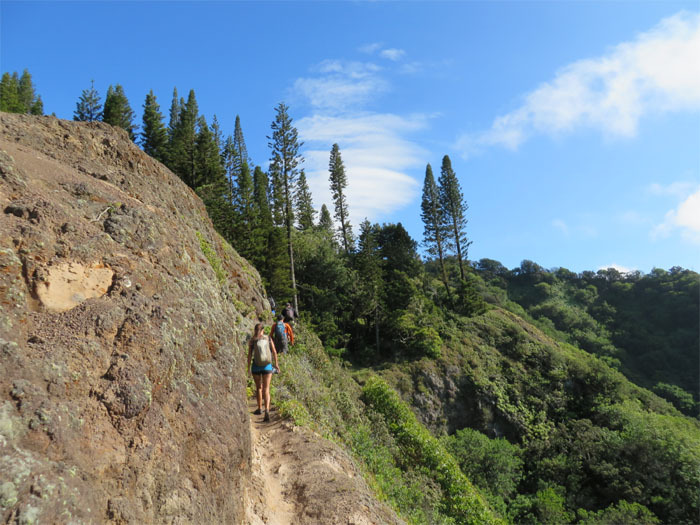 We made our way on the contour trail that is carved into the side of the rock which leads to the fenced area of the preserve, that is gated by towering pine trees. 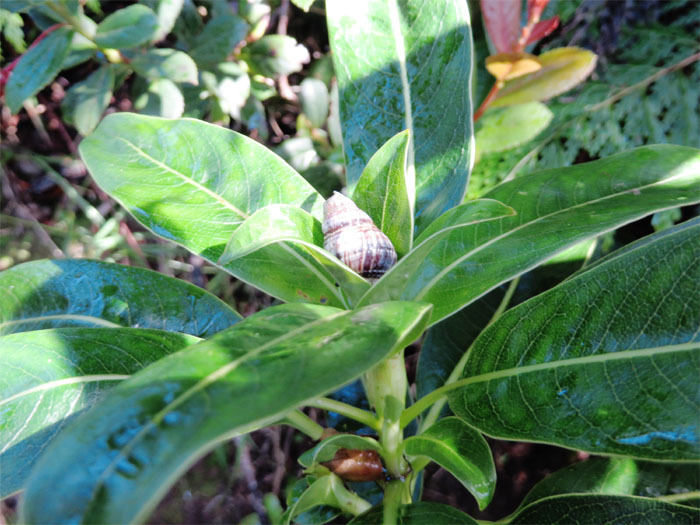 Our first snail sighting – I think these were common snails nestled in the tops of the leafy branches. I found it funny that when you see snails in your backyard, you run for the pellets or think escargot. But in the wild, you pull out your camera. NIMBY. Top of Palikea at 3,098 feet, the views did not disappoint. 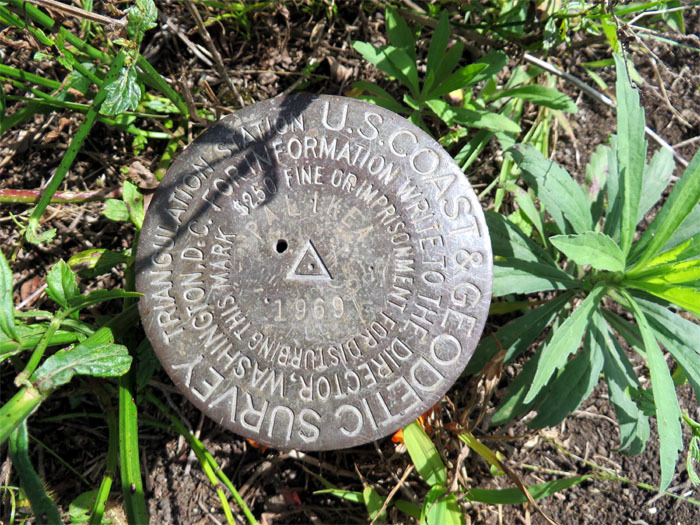 Ranging from Diamond Head to Pearl Harbor to Mount Ka’ala. 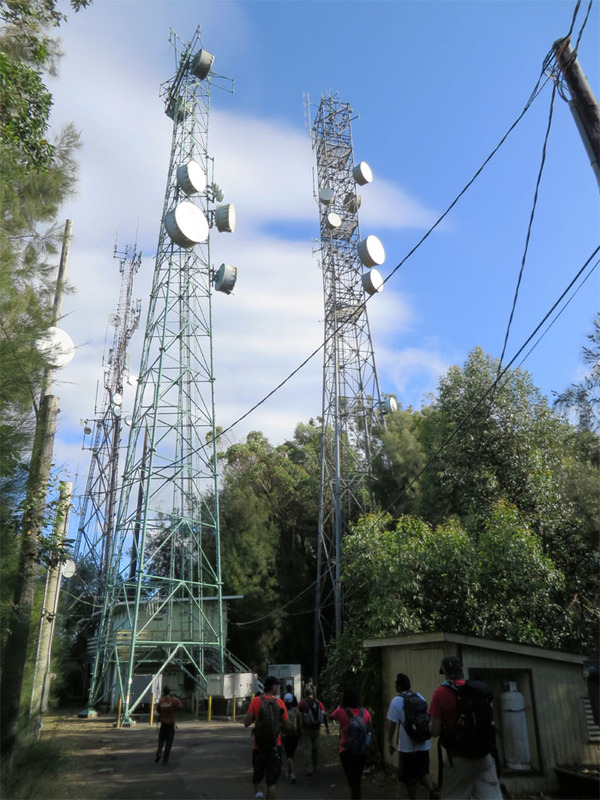 Looking back at where we had been about an hour ago, which are marked by the two communication towers sticking up from the ridgeline. 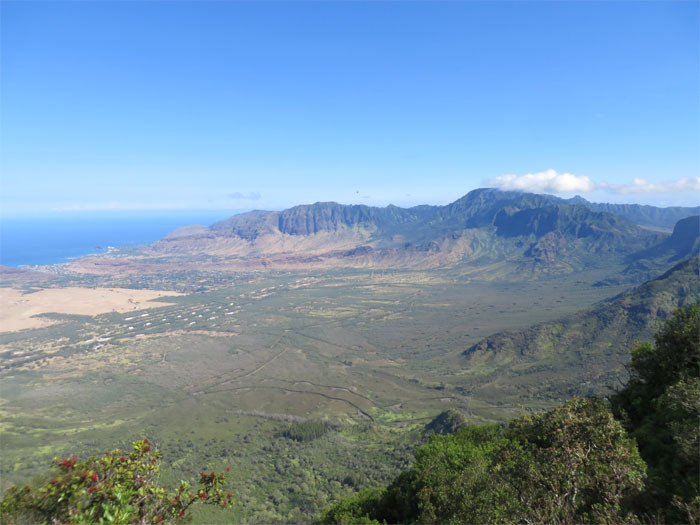 Lualualei is the largest coastal valley on the Leeward side, and is also home to the tallest military antenna towers in the Western hemisphere. After following the ridgeline for about 30 minutes, we turned right and dropped down into a snail and spider rich environment. I finally got to see the spider I have been hearing about so much. 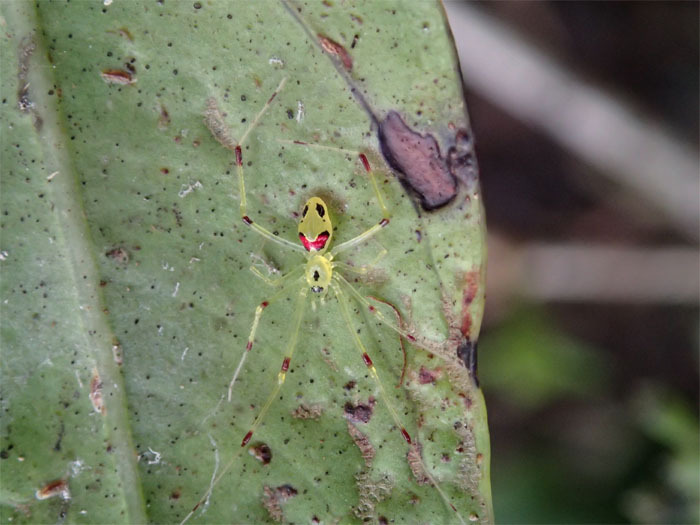 The Happy Face Spider or Theridion Grallator. 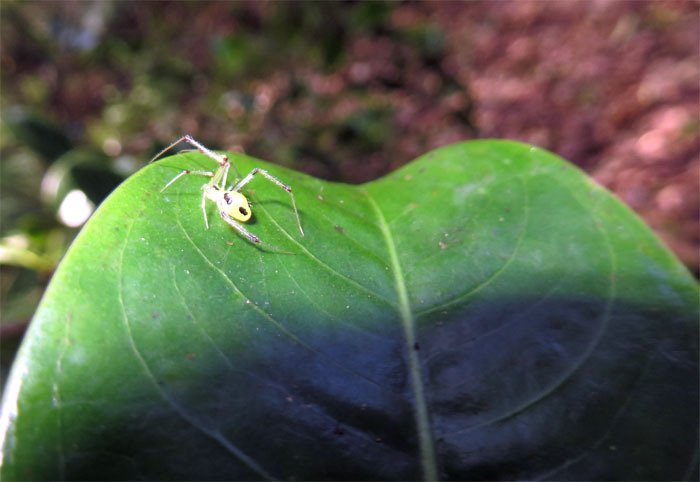 They are very small, about the size of a grain of rice and make their homes under certain types of leaves. 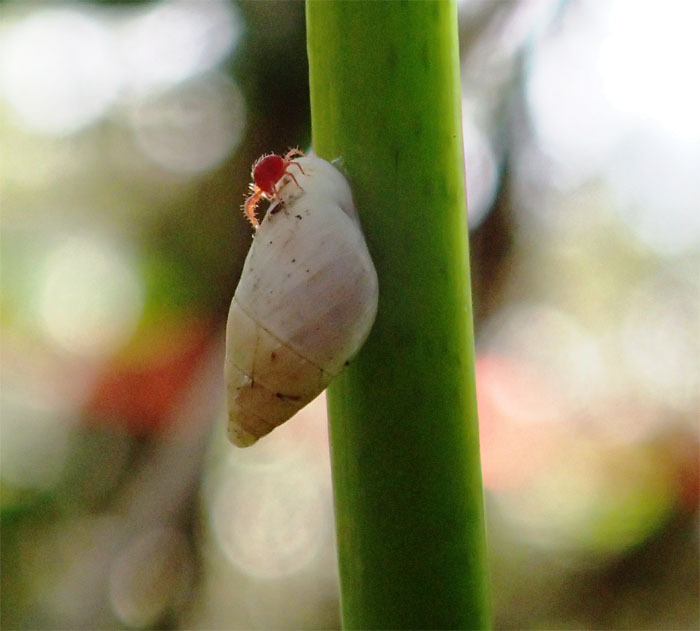 A red spider crawling on top of an white pupu kuahiwi snail. Taking these macro pictures requires a lot of patience. I have a lot to learn. 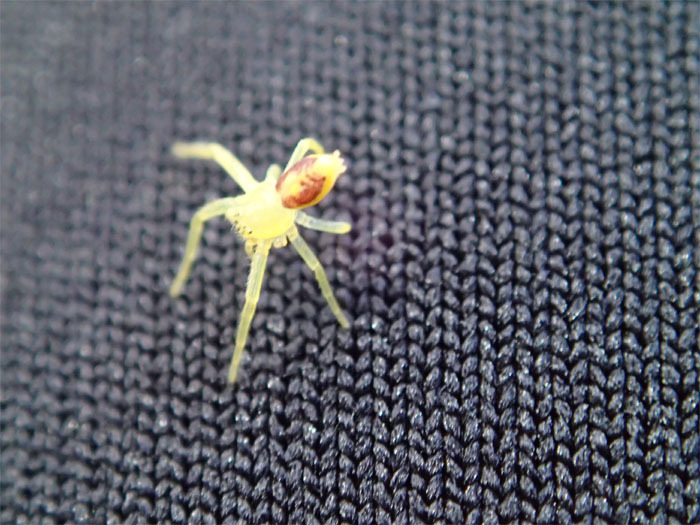 This unidentified spider jumped on Marcus’s shirt. While the rest of us were painstakingly looking for these spiders and snails, one just came to him! 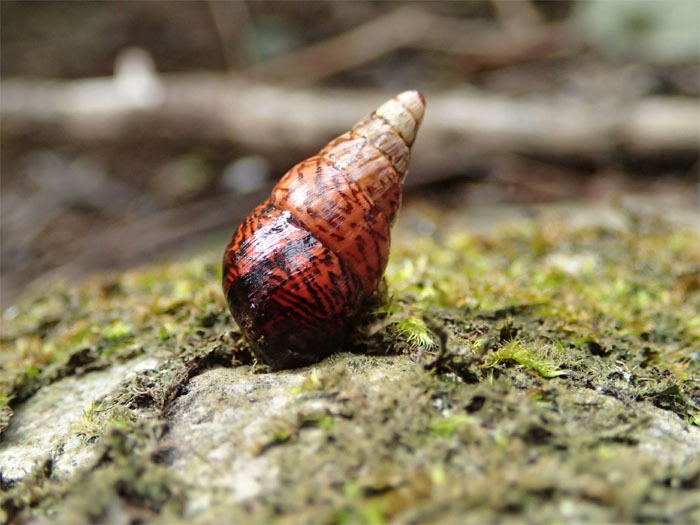 Jay found this rare sanguine litter snail in a pile of poop. Literally. I don’t know how he does it. He should work for National Geographic. 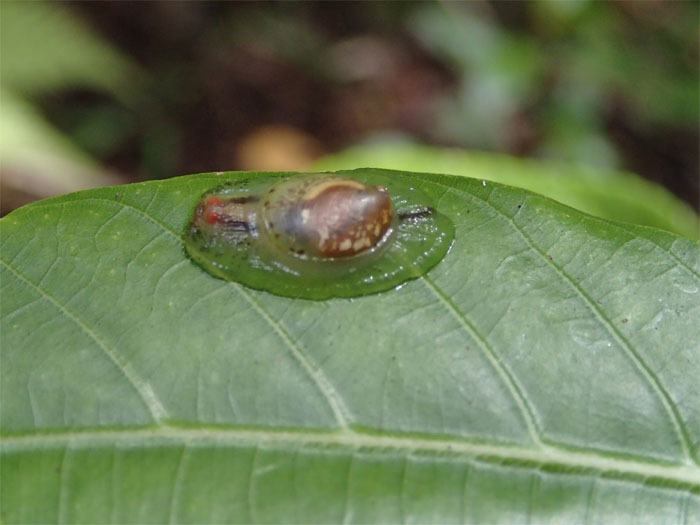 This rather disgusting looking succinea snail is called snot in a hat, for a snail that is too big for it’s shell. 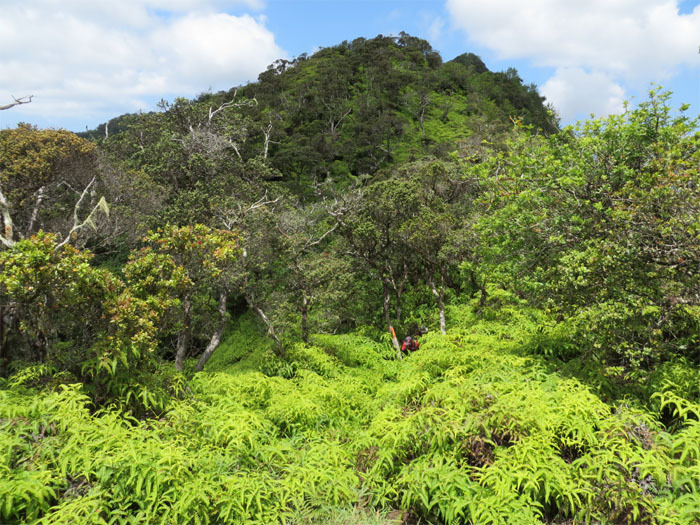 We followed the ridgeline and soon plunged into a huge patch of uluhe ferns, the bane of hikers everywhere. Luckily, there was some semblance of a trail through the ferns, which made for less bushwhacking. “Wait, Royal Kunia Golf Course is that way!” “We were supposed to park at Hawaii Country Club!” We had somewhat of a mix-up in staging directions. The plan was to park Marcus’s car at the golf course that was relatively close to our jeep road exit from Pohakea Pass once we climbed down. Instead we had parked at the golf course that was a long haul away. Taxi! Photo by Aaron Toma. 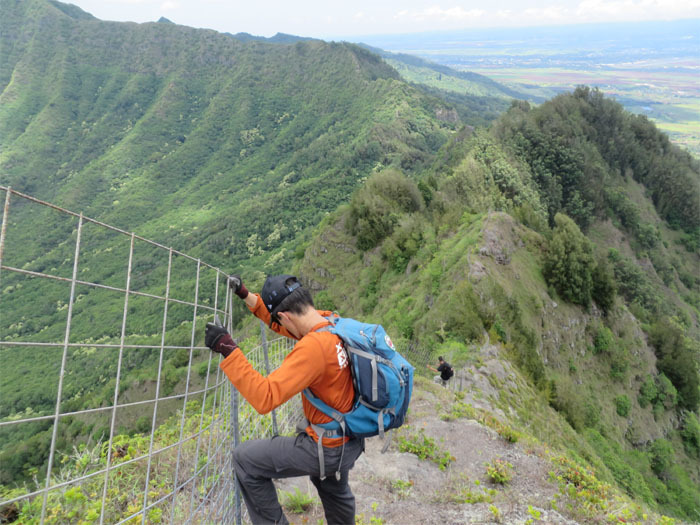 These fences are a common sight in the Waianae Mountain Range. 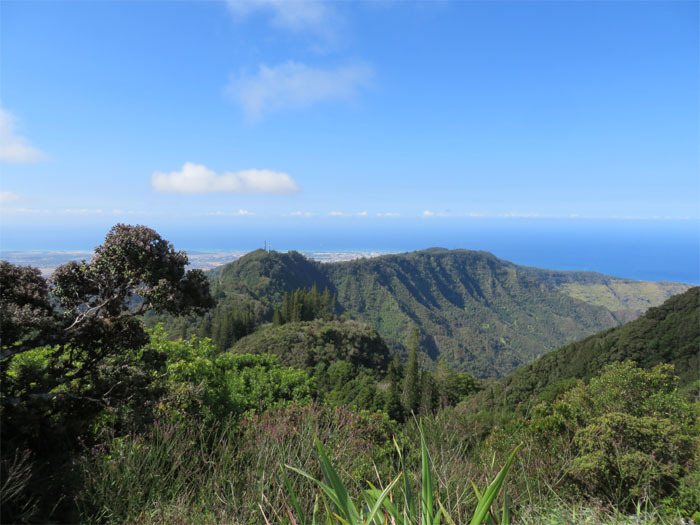 Meant to keep out feral animals such as goats and pigs that destroy endemic flora and fauna. Soon the ridgeline came to a vertical rocky drop known as Pohakea Pass. Photo by Tom Engle. 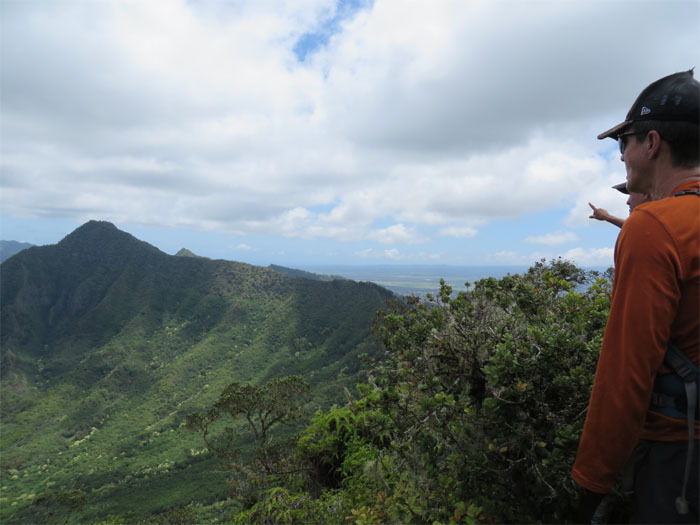 Aaron and Lynn had tagged along to bring back an old webbing that was left by another hiker, Baron Yamamoto, on a prior hike. 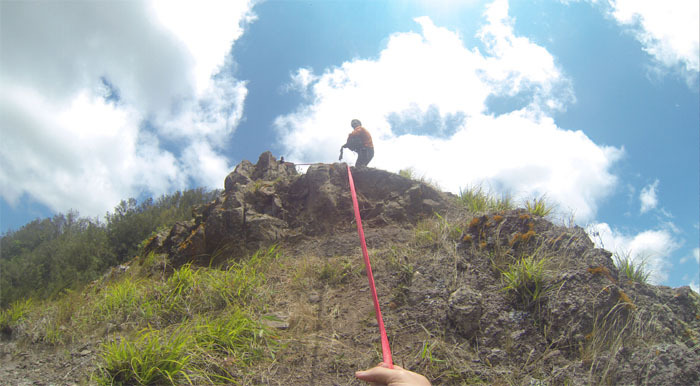 Jay and Tom tied together a 100′ and 50′ webbing to provide support for the climb down to the pass. Just getting down to the pass required webbing, as the whole area was composed of crumbly rocks and loose dirt. 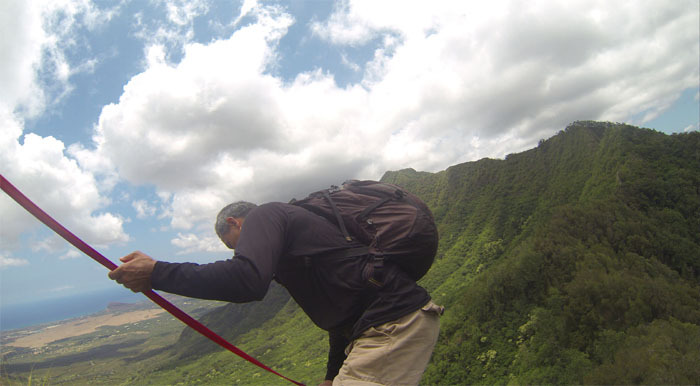 Unfortunately the webbing fell short about 20′ to the bottom. 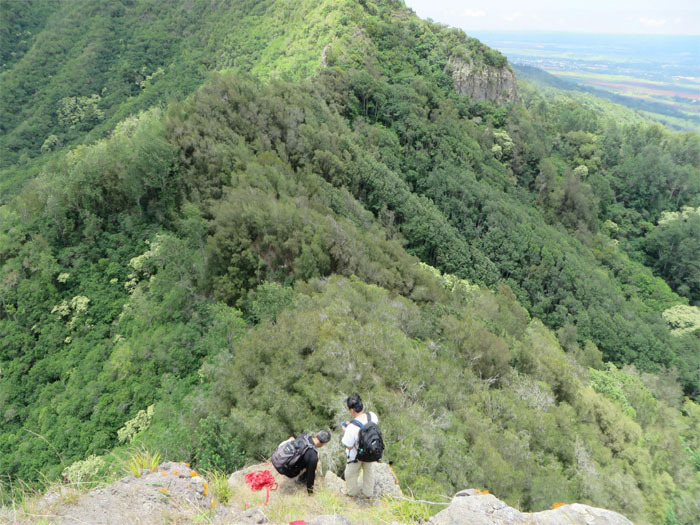 A fellow hiker, Troy Solano, was telling us the last 20′ of the pass was the hardest. Also Baron’s original webbing that was tied around a rock was frayed and not secured enough to be counted on. 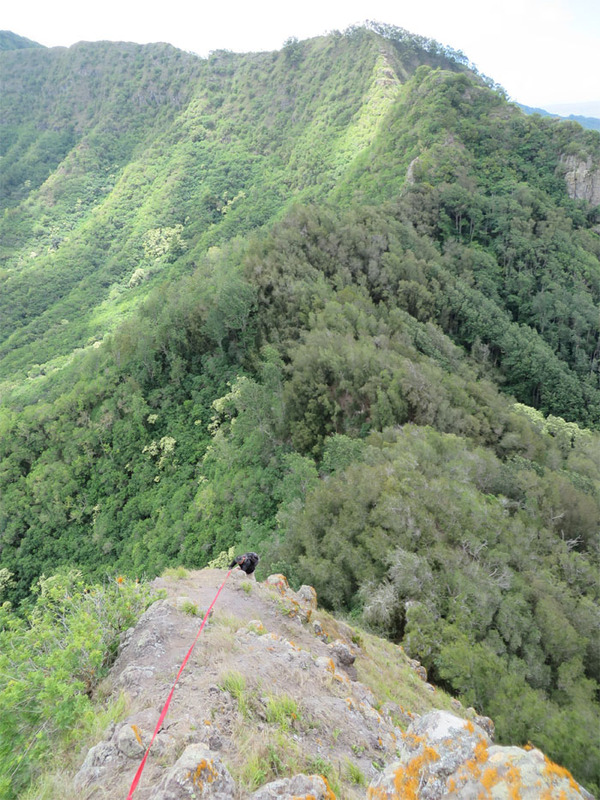 Looking down at the almost near 80′ + vertical drop. 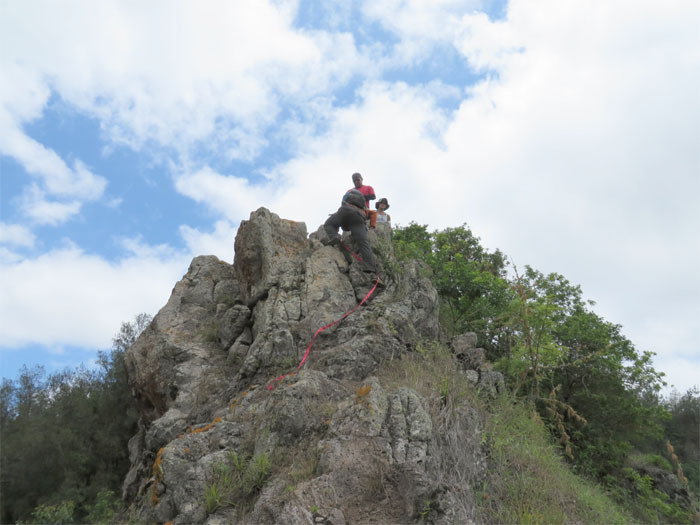 Marcus climbed down about 15′ and didn’t like how it looked, so he came back up. Jay came down to take a look. The concern was the last 20′ that was not covered by the webbing. We would need more webbing for the next time. The face is worth a thousand words. I guess we are going back the way we came. No taxi ride for us! 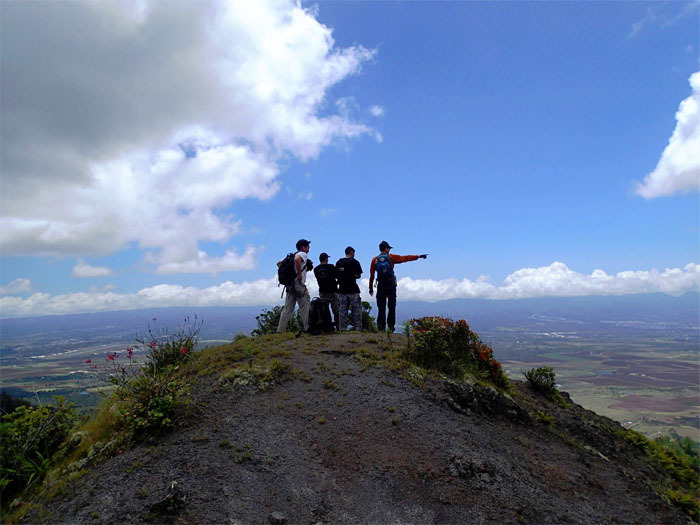 This was my first hike that was not completed as intended, but safety always comes first. I would rather come back and try again, than be on the news or worse. Looking towards Pearl Harbor as we ate our lunch. Click here for the larger image. 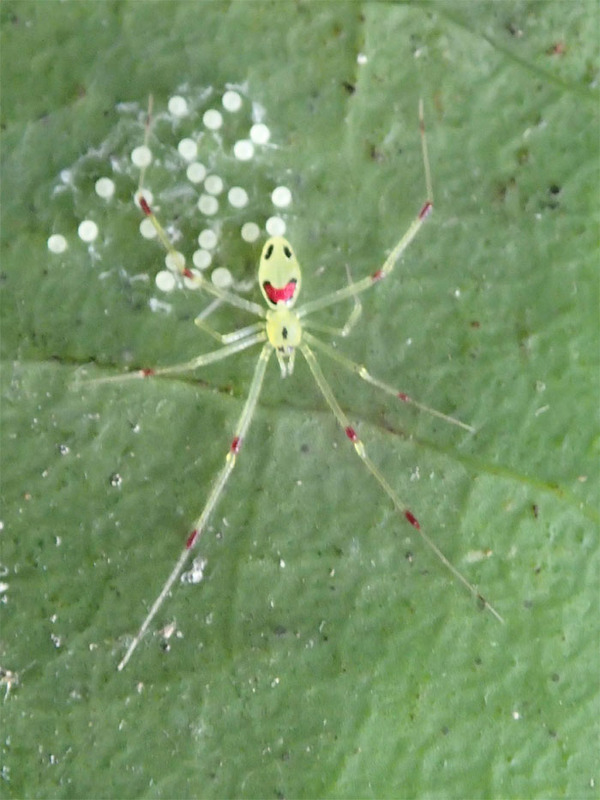 On our way back out, we saw some more Happy Face Spiders, with eggs. It almost made up for not doing Pohakea Pass. Almost. 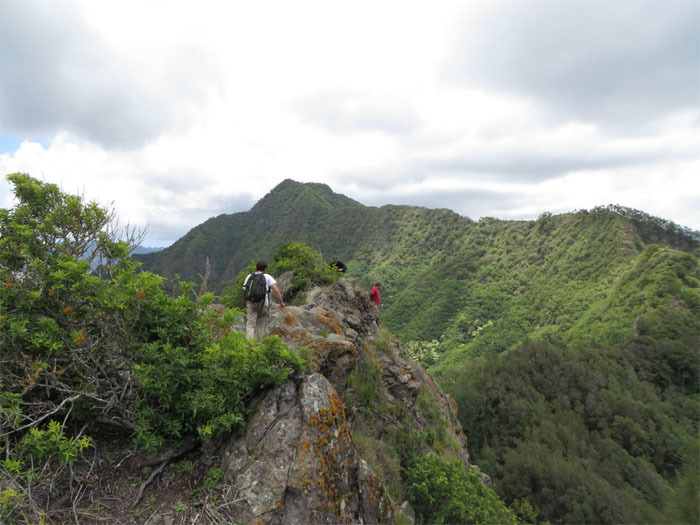 The 5.23 mile exploratory hike took us 8 1/2 hours to complete. Not counting the road that winds up from Makakilo. Doing tomorrow with 200 feet of rope and gear. Hope it’s enogh. 200′ should be enough depending where you anchor the rope. 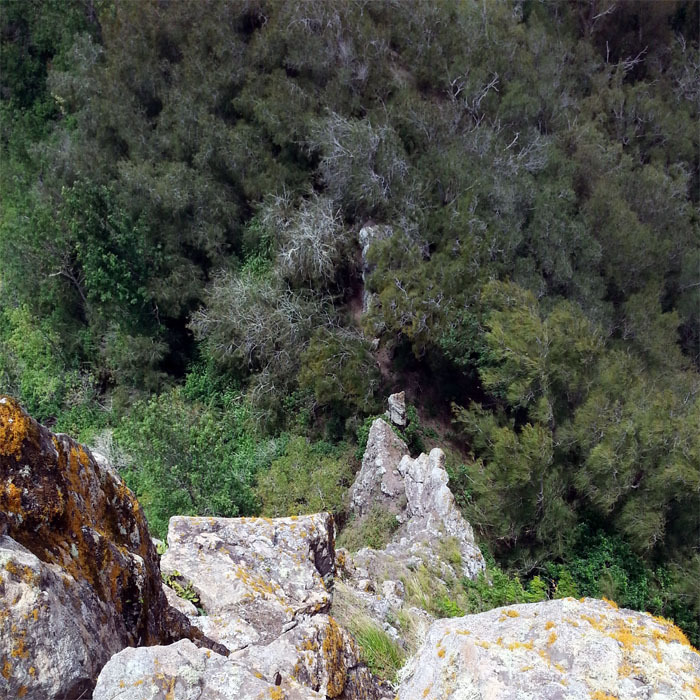 Ended up free climbing it from the bottom which to me is always better than going down. 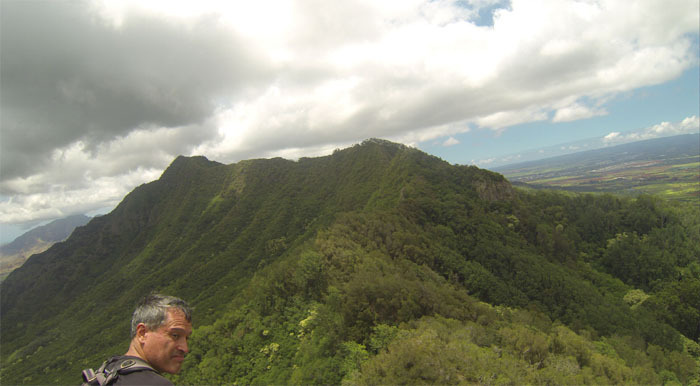 Here’s the link if you’re interested: http://kenjisaito.com/puu-kaua-to-palehua/.